The destroyers Robley D. Evans (DD-552) and Hugh W. Hadley (DD-774) destroyed 23 kamikaze aircraft each on May 11, 1945, as they fought together at Radar Picket Station 15. Michael Staton, son of James Staton who served on Evans, put together this history to honor the men who served on the destroyer, to have a permanent record for family members, and to remember his father. He succeeded in writing a complete history with the ship's deck logs serving as a primary source, but the book does not really capture the crewmen's emotions during the battle with kamikazes and its aftermath. The author talked with many surviving crewmen to create this ship history, but few of their personal accounts found their way into this book. 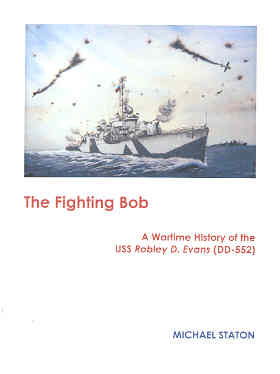 After an extended introductory chapter on Admiral Robley D. Evans, known as "Fighting Bob," the remaining 11 chapters cover the destroyer Evans' history in chronological order. The book includes numerous historical photos, including about 50 photos taken by a crewman aboard Evans. Most of these are posed photos of different groups such as radarmen, electricians, machinists, and radiomen. The narrative does not discuss much about the general course of the Pacific War but rather focuses on Evans from her commissioning in December 1943 to her decommissioning in November 1945. Evans experienced relatively little battle action besides the mass kamikaze attack on May 11, 1945, with the focus of the destroyer's duties being logistic support. However, the destroyer did rescue six downed aviators, and Evans' gunners helped shoot down a Zero fighter making a suicide run on April 2, 1945. "Sea Pawns," the title of Chapter 9 about the kamikaze attacks on May 11, 1945, is a term that describes the radar-equipped destroyers sent to 16 radar picket stations around Okinawa in order to detect and destroy attacking enemy planes before they could reach the main American fleet. At 0755, radar operators reported an estimated 150 aircraft headed toward Radar Picket Station 15 where Evans, Hadley, three LCSs (Landing Craft, Support), and an LSM (Landing Ship, Medium) were on patrol. Combat Air Patrol (CAP) and destroyer guns brought down or chased off many of the incoming aircraft, but four kamikaze planes crashed into Evans, and another three hit Hadley. Evans lost 32 men as a result of these kamikaze attacks, and Hadley lost another 28 men. The book has four appendices, including general data on Evans, a summary of her accomplishments, a listing of US victories and Japanese Units of Kikusui No. 6 that do not have much direct connection to the book's main narrative, and a roster of crewmen who served aboard Evans with arrival and departure dates. The book's last two pages have ten humorous color sketches drawn by Torpedoman First Class Kenneth Beals while serving aboard Evans. The book includes a bibliography of persons interviewed and books used, but the short background on kamikaze contains at least a couple of errors. When describing the legend of kamikaze, Staton incorrectly describes the destruction by a great typhoon of the Mongol fleet approaching Tokyo Bay, not Hakata Bay in Fukuoka (p. 74). The date of the first Kikusui mass kamikaze attack during the Battle of Okinawa is incorrectly given as April 4, 1945, whereas this actually occurred on April 6 (p. 82). Later in 1945, the crew of Robley D. Evans received the Presidential Unit Citation for their heroism demonstrated against the attacking kamikaze aircraft on May 11, 1945. 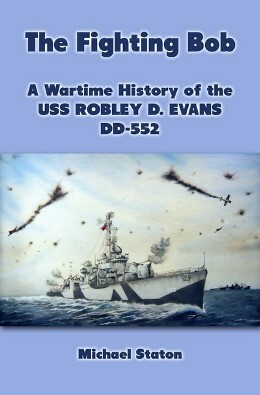 In a book published in 2014, Kamikaze Destroyer: USS Hugh W. Hadley (DD774) tells the story of the destroyer that fought with Evans at Radar Picket Station 15 against the mass kamikaze attack.